The plane that changed the face of the world (military version of DC-3). 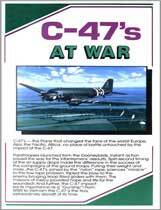 Europe, Asia, the Pacific, Africa.... no place was untouched by the impact of the C-47. From WWII to Vietnam, the C-47 is truly the extraordinary aircraft of its time. b&w and color, 57 minutes.